Carissa’s challenge is to use the 10th anniversary material of tin or aluminium in a project. I can’t believe I actually got out those gilding flakes again. Not only did I open that dreaded jar, but I actually had to sort the flakes. The only jar I have is a gold, silver and copper mix, and I only wanted the silver for this project. Once you get by the incredible mess they make, gilding flakes are fun. 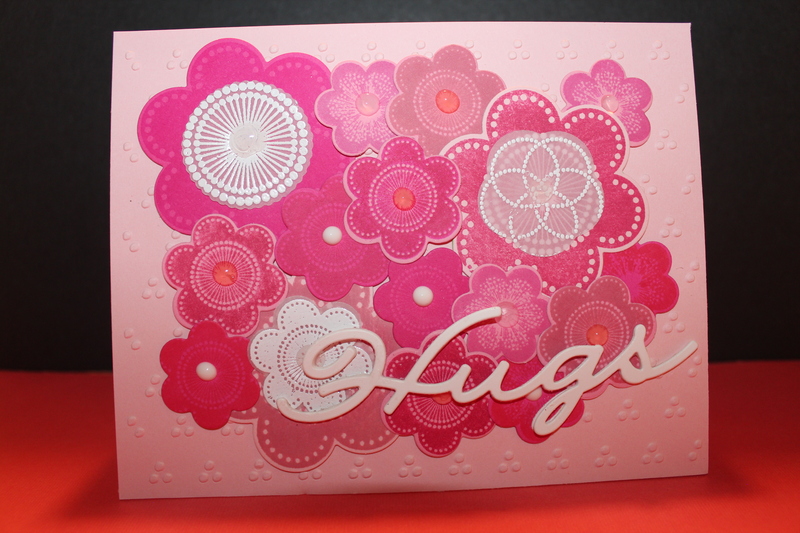 They remind me of the first time I used embossing powder or the first time I pulled a stencil from embossing paste. The results are amazing and you forget all about the mess the flakes made. Debbie’s Challenge was to use wool, which is the material for a 7th anniversary. I was not wanting to have an more encounters with my sewing machine today, so I opted to glue any felt cookies, that I decided to make. I have to be thankful that I own the Friendly Flowers stamp and die sets as they have been put to use multiple times just in this Stamp a faire alone. I loved the look of the ice wafer that Debbie made and wanted to recreate that. The best option that I had was a Waffle Flower die that had stitching holes as i was going to stitch the cookie together, before I got lazy. I used the largest Friendly Flowers die for the sugar cookie, a die from the Shakers and Sprinkles kit for the confetti. The patterned paper is also from the Shakers and Sprinkles kit. While I was looking for cookie possibilities, I came across this Candy Corn die from Spellbinders that I thought would work with the Papertrey Ink wool felt (full disclosure…..the yellow felt is not Papertrey Ink and should not even be allowed to live alongside real wool felt but it was all I had in yellow). Finally, I made an Oreo cookie using the wheel from the Make it Market Market Street kit. I cut it lightly by altering the sandwich in the big shot and it came out marvelously well. It has the impression of the wheel that even looks a bit like the top of an Oreo without cutting through the material. Heather’s challenge is to use the 7th anniversary material of wool on a project. Additionally, she used stitching and a bit of die cut surgery to achieve a layered look. I had to blow the dust off of my sewing machine, before attempting to try some stitching on my wool felt diecuts. In fact, when I turned the machine on, my pressor foot fell off the machine into a couple of pieces. It had been so long since I had my machine out, I had to dig out the manual to figure out how to put the pressor foot back together. Eventually, I got the job done. I also layered the diecuts I used, but limited the felt surgery to trimming the layers on one snowflake so that it appeared that I had three sizes of snowflakes instead of two. I turned the snowflakes into embellishments on a sweater, using the Papertrey Ink sweater die. The lovely wool felt is also from Papertrey Ink. I am always happy with the way this wonderful wool felt cuts cleanly. Yana’s challenge was to make a project using the 6th anniversary material of iron. She used an inlay technique, but I wanted to use the What the Doodle U.S. Map with a very heavy metal embossing powder that was too thick/intricate for inlay. I loved the block look she used, so I incorporated that into my card, though. Laura’s challenge is using the 1st anniversary material being paper. Additionally we are challenged to use up little scraps and add some vellum. This challenge was easy but tedious, as there was a lot of die cutting, and yes, waiting for things to dry. In the end, I think it looks cute a meets the requirements of the challenge. Rebecca’s challenge is to use the 1st anniversary material of paper in a project. Rebecca made three different trinkets from paper. She made some thin paper bows, some tassels and a cute little confetti holder. I concentrated on trying to make something with tassels. This necessitated a fruitless trip to the fabric shop to look for tassel caps. Luckily, I found what I needed in a nearby bead shop. I think the project turned out quite well and I can see myself making a few of these wine tags with tassels, just to have them for wine I give away for hostess gifts. Stephanie’s challenge is to use the 2nd anniversary material of cotton to make something. This challenge seemed simple, but I found it quite difficult. I have built up quite a collection of sad looking wads of coloured cotton balls in my pursuit of a satisfactory looking Cotton Candy. All is well that ends well though, and I was happy to dig out, dye and tie some nice little ribbons on this card that had been hanging out in my stash for a long long time. I had made some glitter backgrounds as per Stephanie’s instructions, but then realized I did not have a Papertrey Ink product on the card. To fix this, I dug out some Papertrey Hooray patterned paper and gave it a glitter treatment. I also made the paper cone out of a matching patterned paper from the same Hooray collection. Nicole’s challenge is to use the 3rd anniversary material of leather or leather like paper to be exact. I don’t put anything away, in case what I am waiting for to dry, needs to be redone for some reason, and I also get out everything I need for the next project and pile it on top. Ugh, what a mess. This project was headed for the big round file a couple of times, but it actually began to not look too bad, once I started applying walnut stain to the card front.